SUNDAYS AT ATLANTA FIRST SUNDAYS 9:45 am SUNDAY SCHOOL AND SMALL GROUP We were not created to do life alone. At Atlanta First, we don't have to. Check out our Small Group and Sunday School classes to find the fit that works best for you! Pastor Jonathan leads a Small Group Study in his office at 9:45am. They are currently studying "Unafraid" by Adam Hamilton. The Saint Andrew Class, taught by Ruth Fruit, Ross Lane, and Dr. Bob Smith, uses the Adult Bible Studies curriculum as the foundation of their study. They enjoy discussions, social activities and caring for one another as well as the larger faith community. The Currents Class, taught by Aaron Moody, is a multi-generational group that enjoys diversity of perspectives leading to lively discussion of the Scripture. The class studies a range of Biblical topics, relating all to their life application. Our Children's Class uses "Deep Blue"; an interactive curriculum for all ages. 11:00 am WORSHIP Make it a priority to worship on Sunday. Invite someone to join you! If you are unable to be here in person, please worship with us online at AtlantaFirstUMC.org/live. Children are an important part of the church family and are welcome in worship. Don’t worry about squirms or sounds, children remind us of the faithfulness of God! Should you choose, there is a Nursery available each Sunday for infants and toddlers. On 1st Sundays, we love to worship together as a family in the Sanctuary and take Communion together. On the 2nd - 4th Sundays of the month, Pre-School through 5th graders are invited to Children’s Church after the Children’s Moment in worship. Let us know how we can make your family feel at home. UMCOR SUNDAY We will receive a special offering for the United Methodist Committee on Relief (UMCOR) that directly affects their ability to respond immediatley to disasters. 5:45pm in the Gym BASKETBALL Open gym basketball. 7pm in the Choir Room CHOIR REHEARSAL Love to sing? We'd love to have you join the choir! SEDER MEAL 6pm. Please make a reservation with the Church Office by April 4th. 3rd Sunday MONTHLY CHURCH LUNCHEON Following Worship @ Atlanta First Bring your favorite side dish or dessert to share. No Luncheon Easter Sunday, April 21. MOTHER'S DAY We will receive the Wesley Woods Mother's Day Offering. This offering helps Wesley Woods to cover the cost of health care, meals and wellness programs for low income, older residents. 4th Tuesday HOSPITALITY HOUSE DINNER 6pm @ 1815 South Ponce de Leon Ave. Bring a dish to serve and fellowship with guests. Reshaping the future of the church requires setting aside old assumptions, fears, and stereotypes to embrace new experiences and methods. In their new book, "Blank Slate", Rev. Lia McIntosh, Rev. Jasmine Smothers, and Rev. Dr. Rodney Smothers explore generational transition, design thinking, and successful private sector organization to discern a new direction for the church. They name seven mindsets essential to create your own “blank slate” and embrace a new future. "Gracious God we are your children standing in need of your wisdom and of a vision larger than ourselves. Pour your Holy Spirit upon us." 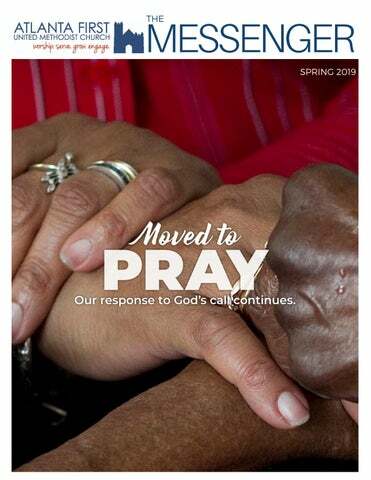 - Bishop Sue praying at the Special General Conference For more information about the 2019 Special General Conference, the North Georgia Conference is hosting a District Gathering. Rev. Dr. Jacqui Rose-Tucker and the Disciple II Class will prepare a Seder Meal on Friday, April 13. As Judeo-Christians you are invited to participate in this sacred community meal celebrating with MESSIANIC Jews, this last supper of Jesus. You will not want to miss the Haggadah experience and the delicious food! Passover, perhaps more than any other in the Jewish calendar, really sticks to the script when it comes to the menu. at a seder—haroset, matzo ball soup, and brisket—are so good that they can’t be skipped, not even for one year. with a crackly caramel-cherry-almond brittle topping. PLEASE MAKE A RESERVATION WITH THE CHURCH OFFICE BY APRIL 4TH. Atlanta First would love your help to make Sunday morning a time of radical hospitality, spirituality, and love! Volunteer as often as you like: weekly, monthly, or on a as needed basis. GREETERS provide a friendly welcome and offer refreshments. USHERS act as host to our community and collect the offering during the worship service. ACOLYTES assist in worship by lighting and extinguishing the candles and assisting the Pastor as needed. KID'S MINISTRY volunteers are needed in the nursery and Children's Sunday School and Children's Church. HOSPITALITY volunteers help with monthly luncheon and special activities throughout the year. Spriritual Gifts A Spiritual Gift inventory will help you discover your spiritual gifts and ways your uniqueness can serve to strengthen the whole body of believers. If you are interested in serving in Leadership at Atlanta First, please complete a Spiritual Gifts Inventory at the webiste below. CHURCH DOOR MINISTRY: Donations of packs of peanut butter or cheese crackers, granola bars, and bottled water are needed for our weekday homeless ministry. #KEEPATLWARM: Our ongoing ministry to provide jackets, gloves, hats, etc. to our homeless neighbors. Gently used backpacks, bags and suitcases are also needed. Donations can be dropped off in the donation bin outside the Pastor's Conference Room. FRIENDS AT THE FRONT DOOR: You don't want to miss the third Saturday of each month as we serve our Friends at the Front Door! We give bag lunches, toiletry items, and have a time of fellowship and prayer with our homeless neighbors. Visit AtlantaFirstUMC.org to see a complete list of items needed and to sign-up to donate. HABITAT FOR HUMANITY: Our annual Habitat for Humanity home build project this year begins on Saturday, April 6th, running weekly through June 8th. Our Habitat coordinator, Erin Devine Martin, is hosting two 15-minute online information sessions to introduce the project and go over the schedule. The sessions will take place 6:30 to 6:45 pm on Wednesday, March 20th and Thursday, March 28th via a Zoom virtual conference at: http://bit.do/habitat-afumc. SAFEHOUSE OUTREACH DINNER: This is a mission ministry to feed the hungry that Atlanta First supports on the first Tuesday of each month. We prepare a meal at Atlanta First then travel and serve at SafeHouse Outreach. We have fellowship and pray with the homeless guests. Their prayer cards are placed on the Altar Rail the following Sunday morning and you will have the opportunity to pick up one and pray for that person during the month. We meet here at 4pm to prepare the meal. At 6pm, we will travel to SafeHouse to serve and worship with our guests. Visit AtlantaFirstUMC.org to see a complete list of items needed and to sign-up to donate. MARY HALL FREEDOM HOUSE DINNER: The Mary Hall Freedom House exists to empower women to end the cycles of addiction, poverty and homelessness for themselves and their children. On the first Thursday of each month, we meet at Atlanta First at 4pm to prepare a meal, then go to the Freedom House to serve the meal and have fellowship with their guests. HOSPITALITY HOUSE: Since 1981, Atlanta's Hospitality House has provided a "home away from home" to outpatients and relatives of patients hospitalized in 21 local hospitals. We meet there at 6pm on the last Tuesday of each month. Bring a dish to share and fellowship with guests. Save the Dates: TUESDAY, APRIL 9TH: Join us for our spring Brown Bag Lunch at Peachtree Christian Church. We will discuss best practices for screening and vetting potential clients. All outreach coordinators and clergy are invited to attend. SUNDAY, APRIL 28TH: Congregations are invited to join Team Midtown Assistance Center for the Hunger Walk. This is a great event for youth groups and social clubs. Be sure to join team M7200 and a portion of your entry fee is donated to MAC! SATURDAY, MAY 11TH: Runners and walkers of all ages are invited to our Midtown Race for MAC 5K in Piedmont Park. Registration available soon. If any businesses or groups in your congregation are interested in sponsoring the event, please contact Chris Ferguson, Development Manager. Current Needs Group Volunteer Opportunity: We need a group of 3-7 people who can help us re-organize the clothing closet. This is a great project for a confirmation class or social club. Pantry Needs: Laundry Detergent, Dish Soap, toilet paper, and deodorant. Admin Needs: We are looking for a volunteer with Adobe InDesign experience to help design our Annual Report. MAC's Annual Luncheon Pictured: Jenny Jobson, Executive Director, Rev. Jasmine Smothers, Dorothy Chandler, Jeanne Spencer, Alisa Smallwood, Suzie Moody, Aaron Moody, and Holley Forsyth. Digital Inclusion Last fall, the AJC named the digital divide the "civil rights issue of our time." At MAC, we are working to correct that. We are offering clients with school-aged children computers and up to a year of paid internet access. In addition, we have provided an entire 3rd grade class at Hope-Hill Elementary School, with computers to encourage digital learning. To find out more or get involved, contact Mitch Parsons, Operations Manger. GLOBAL CHRISTIANITY — CHRISTIANS LINKED BY BAPTISM TO THE KINGDOM THAT TRANSCENDS ALL NATIONS In recognition of World Communion Sunday, the flags were moved to the Parlor, where they flank the beautiful stained glass windows. This led our Worship Team to think about the reason they were moved for this special worship service and to come to the decision to keep them in the Parlor. The following response to a request for help with the issues of placement of the Agmerican flag and the Christian flag in the Sanctuary was written by Hoyt Hickman when he was a staff member of the Discipleship Ministries. parts of the service — pulpit, lectern, Lord's Table and baptismal font. The way many chancels are designed, placing a flag to the right of all the points from which the clergy presides would mean placing a flag so far to the side that it is obviously not being accorded the place of highest honor but is shunted off toward or into a corner. It is important to remember that the Christian flag originated almost a hundred years ago in churches that usually did not display a cross in the sanctuary other than the white cross on the blue field of the Christian flag. Today, of course, most United Methodist churches have a cross in the sanctuary in what is obviously intended as the place of highest honor, on or above the Lord's Table. Since this cross serves the same function as the Christian flag, it renders the Christian flag unnecessary. It also places any American flag present in a position of relatively lower honor. Given the provisions in the U.S. Flag Code and the fact that a cross serves as a symbol of allegiance just as a flag does, I do not see how we can properly display the American flag in the chancel if there is a cross there. Because of its central and higher location, the cross plainly has a place of higher honor than the American flag. The same difficulty arises when the American flag is carried in a processional at the opening of a service and the processional cross goes first, as Christians agree it must. There is still another difficulty in displaying the American flag in the place of highest honor during worship. It is one of the oldest and most universal Christian understandings of worship that when we gather around the Lord's Table for worship, the gathering consists not only of God and the visible congregation, but also includes (even though invisibly) the whole universal church of all times and all places, in heaven and on earth. Even if everyone visibly present is an American citizen, most of those invisibly present are not. To sum it up, we in American wisely separate church and state. As American Christians, we honor the cross and we honor the flag; but we keep them separate. An American flag used in the worship of the universal church is no more appropriate than hanging a cross in a civil courtroom used by Americans of all religions. Lillian Roberts Deakins Lillian was a lifelong member of Atlanta First. She served as a Trustee and was an active volunteer in the Atlanta community. Margaret Richardson Kirby February 27, 1918 - January 1, 2019 Margaret was a member of Atlanta First for many years and worked in the office and served as hostess. Mary C. Wilson February 2, 1922 - January 19, 2019 Mary joined Atlanta First in 1952. We want to wish you a Happy Birthday! If we missed you, we are so very sorry! Please make certain we have your complete birthdate. Call or email the Church Office, or include it on your Connect & Engage Card in Worship on Sundays!